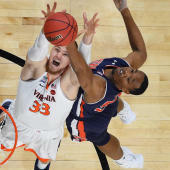 Seventh-ranked Tennessee exacted revenge against fourth-ranked Kentucky on Saturday in a 71-52 victory that moves the Volunteers back up to the top line of the projected bracket. The Wildcats, who were a No. 1 seed entering the game, will fall back down to the No. 2 line. At 25-3 with eight Quadrant 1 wins -- and losses only to top 20 teams -- the Vols have earned their place as a No. 1 seed. Tennessee's losses have been to Kansas on a neutral court, at Kentucky and at LSU. Of course, these two could still meet again in the SEC Tournament. Michigan State was the biggest loser of the teams near the top of the bracket. The Spartans are not playing at full strength, and it shows. Josh Lankford was averaging 15 points per game before his season ended due to a foot injury. Nick Ward, the team's second leading scorer and rebounder, is out indefinitely with a broken hand. He is expected back ... eventually. Now, coach Tom Izzo said after the game that a back injury to key reserve Kyle Ahrens could be season ending. Indiana came back from 12 points down to beat Michigan State and sweep the season series. The Spartans only fell five spots on the 1-68 list in the bracket, but it happened to result is a two seed drop. The Hoosiers are now 15-14 and still two wins from the bubble. They finish at Illinois and home vs. Rutgers, and if you have followed the Big Ten at all this season, you know those game are not as easy as they seem. Despite six Quadrant 1 wins, Indiana has to win those two games to have any hopes at an at-large bid. The bottom of the bracket is churning with more teams hurting themselves rather than helping. However, two teams picked up huge wins and all but secured spots in the field. UCF broke Houston's 33-game winning streak and Utah State knocked off Nevada to take over first place in the Mountain West. The more I look at NC State's resume, the less I think the committee will like it. The Wolfpack has yet to beat a tournament quality team away from home, and their best wins have only come against other bubble teams. Their final chance of the regular season fell by the wayside on Saturday with a loss at Florida State. They have the worst nonconference schedule the selection committee will have seen in the 25 years I have been tracking the selection process. NC State's NET ranking is inflated by the fact that they blew out the litany of bad teams they played. Even in a soft bubble, they are still going to have a problem getting selected. They could end up being an interesting early test case for how much the committee is going to value margin of victory this season. Check out Jerry Palm's full bracket with all 68 seeds and the first four four teams out on our Bracketology page.